An insulated, water-resistant camera cover for shooting video in challenging conditions. 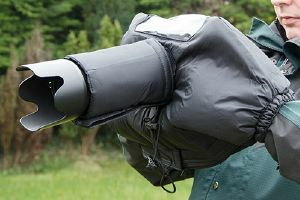 Includes internal pockets for heat packs, an attachable extension for longer lenses and an attachable viewfinder loupe cover. When shooting video in challenging conditions such as rain, snow or cold, your camera needs protection from the elements. This padded cover is water-resistant for wet conditions with clear panels at the rear and top for easy viewing of the LCD screen and controls. It is also well-insulated and includes three internal pockets which can hold heat packs (not included) to keep the camera battery - not to mention your hands - warm in freezing weather. Elasticated cuffs on either side give you easy access to the camera controls. Your EOS camera can easily be inserted into the cover with lens attached, with zips at the base ensuring the cover stays closed securely around the camera. If required, the zips can be opened to allow the camera to be mounted on a tripod with the cover still in place.There is an adjustable (by drawstring) aperture at the front of the cover for a short lens. For longer lenses (up to 26cm long) a padded, water-resistant lens cover (included) can be attached to extend the cover, keeping your lens dry and protected too. The clear panel at the rear can be opened to allow an LCD viewing loupe to be fitted. A separate cover (included) can be attached at the rear to cover a viewfinder loupe. 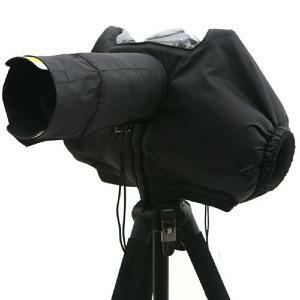 The loupe cover can also double up as a viewing hood in bright conditions. Note: Although it’s possible to use this camera cover for regular stills photography, it is designed primarily for video photography.